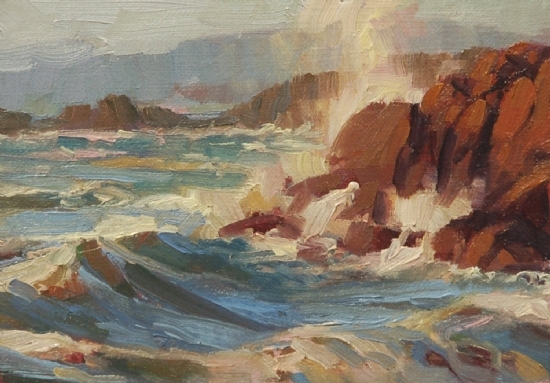 Big movement happens in a small space in the Norwegian Artist’s Coastline, a 5×7 miniature headed to the 33rd Annual Sagebrush Art Festival, January 29 and 30 at the Running Y Ranch and Resort. Benefiting the Exchange Club of Klamath Falls, the Sagebrush Art Festival features fine art from fine artists throughout California, Washington, and Oregon, and Steve’s works of the Oregon Coast feature strongly in the collection of his works there. Coastline joins 10 others for the festival. The Norwegian Artist invites you to join the e-mail list for the once-a-month, short and informative, e-mail newsletter of Steve Henderson Fine Art.